It was a special day today when Pope Francis joined the Congregation in prayer and then gave an input and received questions from the members for over two hours. His very presence was a grace and his input which is published in many languages was inspiring. He encouraged the Jesuits to plumb and share the depths of Ignatian spirituality. It is a spirituality of joy and consolation and a force for discernment in seeking the greater good in all places and spaces. 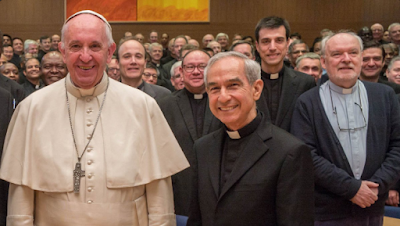 He did not give prescriptive or descriptive plan to the Jesuits for the next number of years. He allowed the process of the Congregation to discern future plans and mission. In relation to the identity and mission of the Jesuit he recalled the words of Pedro Arrupe when he said that Jesuits must be present where people hurt and be a voice and sign of prophetic audacity and bring consolation and compassion into the lives of people who hurt in our world. It is now the work of the Congregation after reading and hearing of the themes which many Provincial Congregations presented over one year ago for consideration how it will describe its mission today and tomorrow. Much discernment has already been done in preparation for this meeting and what will emerge at the end of our Congregational present is quite a mystery. What is clear is that a time line is needed in order to complete a number of issues or else energy can wane. Let us continue to pray the Holy Spirit to guide us.